Lakeside''s beloved dragon which will soon be returned. 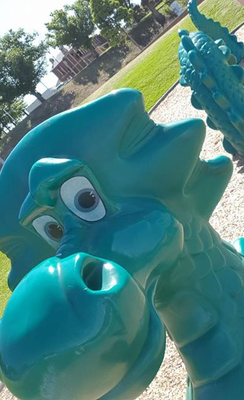 Lakeside Park’s beloved dragon will return to its Clearwater Drive lair this month, following considerable uproar from the community over the quirky creature’s removal. The blue reptile – bearing uncanny resemblance to the mythological Loch Ness Monster – was the centrepiece of Pakenham’s Dragon Park. 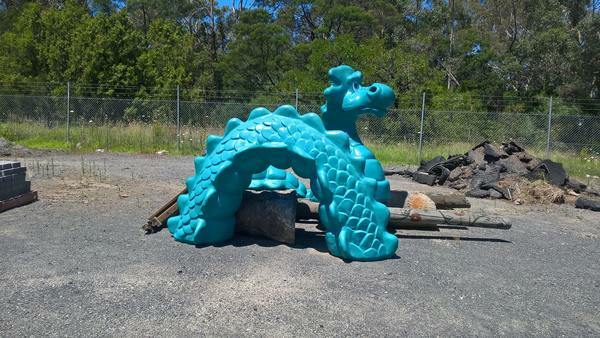 When Cardinia Shire undertook a $150,000 revamp of the playground, the treasured dragon was placed in storage. Subsequently, the council launched a survey to determine the future of the dragon – affectionately referred to by Lakeside residents as “Dragon”. More than 200 ratepayers hurled their support behind the creature, facilitating its return to Clearwater Drive. The dragon, being interpreted by Cardinia Shire officers, has regularly been “liaising” with the community in the lead up to its release. ‘Well, at the moment I am near the end of my holiday, tucked away in a little cave at the council depot and will soon be coming back to Dragon Park, but first some really nice people from council are going to make a bed of nice soft mulch for me behind the toilet,” council staff relayed on behalf of the dragon. The dragon originally rested inside the toddlers’ playground, but he will now be stationed near the public toilets. He was removed in December, 2016 and has collected dust at the council’s Purton Road depot since. The Lakeside Residents Group has arranged a homecoming event for the dragon, in a bid to welcome him back to his den. Secretary Tony O’Hara said the community has patiently awaited the dragon’s return. “Through a bit of lobbying, council agreed to return the dragon,” he said. The dragon is reportedly very popular with children, who climb onto the creature’s back and take selfies. An exact date for the dragon’s return has not yet been set, but it is expected to take place over the next several weeks.